If you are looking for profitable BTTS predictions, you are at the right place. Our expert tipsters publish free daily both teams to score betting tips from UK, European and International football leagues! Copy & win! If there’s one thing we love about the football, it’s the goals. The main purpose is to stick it in the back of the net and it can’t be denied that the more there are, the more exciting the game. That’s if they’re in favour of your team of course! Betting on goals is a real thrill too and the BTTS market is just about the most popular out there. You can get some fantastic odds on both teams to score and you’re in with a great chance of winning with our BTTS tips from some of the best tipsters around. We bring you all the top value BTTS betting predictions on today’s games and continually bring you the best odds across the Premier League, Champions League, La Liga and many more. Below you’ll find our expert pundit’s top BTTS tips for today with some of most trusted bookmakers. So, why not enjoy the action and grab yourself a prize pot? Firstly, if you’re new to betting you’re going to want to understand what BTTS actually means. That’s quite simple. It stands for Both Teams To Score and is a bet that does exactly what it says on the tin. BTTS is one of the most common bets out there, and with good reason too. You can make some nice money off a BTTS wager from simply watching the goals fly in. BTTS stands for both teams to score and betting on the market means you’re doing just that, betting on both teams in a football match to score a goal. That can be in either half and the result can go either way, although you can also place bets on a BTTS and win market, also known as Match Result and BTTS. How Do I Win A BTTS Bet? To win a BTTS bet, all you have to do is back a game where both teams score a goal. For example, let’s say you were to place a BTTS wager on Liverpool v Manchester City. 1-1, 2-1, 1-2, 3-1, 2-2, 1-3, etc. You would lose the bet if the result involved one team failing to score. This would mean 0-0, 1-0, 0-1, 2-0, 0-3 etc. would mean you miss out. Essentially, the lowest scoring result you could win on a BTTS bet would be 1-1. However, other markets involving both teams to score require higher scoring outcomes. There are a number of BTTS markets to enjoy within football betting, and they all get gradually harder to win than the standard both teams to score wager. Adding other aspects to your BTTS bet will increase odds significantly though and you can get a really good payout, if you’re brave enough to take one on. Below you’ll find a number of markets that will increase your odds and give you a better chance of the big bucks. 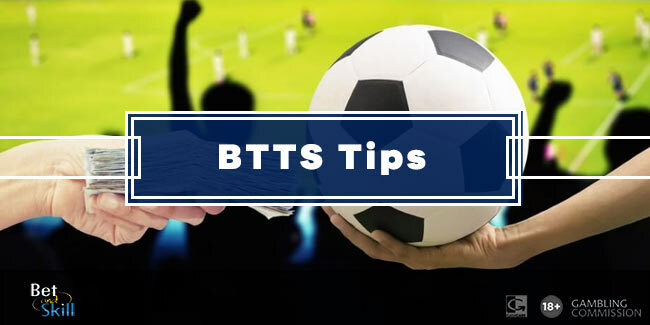 Match result and BTTS bets, also known as BTTS and win, are basically two bets rolled into one, meaning you can get big wins from relatively small odds. You can earn those big ones because of the high odds and the difficulty of getting it right. That’s because you need both teams to score as well as predicting the correct winner of the match. That means the lowest possible score within this bet is 2-1. For example, taking Liverpool versus Manchester City again, you’d win by doing the following. If you were to place a BTTS and win bet backing Liverpool, you would need the Reds to win and the result to be at least 2-1, with Manchester City guaranteed a goal. In this case, results such as 2-1, 3-1, 3-2, 4-2, 4-3 etc. would see your bet paid out. However, if Liverpool were to win 1-0, 2-0, 3-0 and so on, then you would lose your bet as only the Liverpool win aspect of the bet came through. Naturally, if the game was to finish a Manchester City win or draw you would also lose as the other part of your bet would fail. It is possibly to bet on a draw and BTTS, in which case the minimum winning scoreline would be 1-1. A BTTS in both halves bet is a tricky one to get right as ultimately it’s two BTTS bets rolled into one. The first BTTS bet is for both teams to score in the first half, while the second is the same outcome in the final 45 minutes. This means that the minimum number of goals would be two a piece. Again, the final result is irrelevant, so if it was the example above, it wouldn’t matter if Liverpool or Manchester City won, or the game ended in a draw, the game would have to be at least 2-2 though. It’s why this wager has such high odds and you can make some serious money, it’s a match result that is hard to predict and doesn’t happen very often. You can, or course, add all these to an accumulator. We offer some fantastic accumulator tips here at Bet and Skill and will often add some BTTS wagers within them. A BTTS accumulator can boost odds significantly and while adding BTTS bets into an acca can be risky, the rewards are huge. As with any accumulator, the more lines you place in it, the higher payout you’ll receive if your bet comes through. When Should I Place a BTTS Bet? There a number of reasons a BTTS bet is worth backing, but it’s well worth studying the form before placing. There are many things that need to be taken into account, first and foremost the game it is. Naturally, if an in-form big team is taking on bottom of the league, the chances of both teams scoring are significantly less. It’s also worth taking into consideration things such as leaky defences, in-form strikers and head-to-head records. Additionally, the significance of a game can also dictate how tight or free-flowing a game is, with the latter more likely to produce goals. What Leagues Can I Place BTTS Bets On? Today, the opportunities to bet on BTTS is endless. No matter what the league, the likes of Betfred and Paddy Power will offer you almost every league imaginable. Of course, you can back every league game in Britain, from Premier League BTTS bets and Scottish Premiership, to the Championship, League One and even the National League. That extends across Europe and major competitions including the Champions League and Europa League as well as the likes of La Liga, Serie A and the Bundesliga. Ultimately though, you’ll find even the most obscure leagues covered. If there’s football being played, you’ll be able to place a BTTS bet. All the best online bookmakers will offer BTTS markets, with the variants of market varying from bookie to bookie. You’ll find standard BTTS and match result and BTTS odds available across almost all outlets, although some offering some more exciting markets. The likes of Bet365, Ladbrokes and Betway all have large BTTS markets, available on almost every league imaginable. So, whether you’re looking to place a BTTS bet on the Premier League, La Liga, or Italian Serie A, you won’t have a problem finding some odds. Can I Get BTTS free bets? If you’re new to BTTS betting a good place to start is with a free bet. We collate all our favourite free bet and no deposit free bet offers from all major bookmakers for you to treat yourself to an outside bet and even hone your skills. Most bookies will offer free bets upon sign up and you can bet on almost any market, including BTTS. Check out our bookmakers for all the best free bet bonuses and get playing the both teams to score market today. It really is one of the most exciting wagers you can make! Where Can I Find BTTS Tips & Predictions? At Bet & Skill we continue to offer the best BTTS tips and predictions each and every day. We have expert tipsters across all Europe’s top leagues and bring you amazing predictions for almost every match up. You’ll find all our BTTS tips on our Tips & Strategies page, while you’ll also find a selection of BTTS bets across multiple leagues on this very page. But don’t worry, you can make sure you don’t miss a thing by following us on social media, where we post all our tips and previews as well as some incredible betting offers to combine them with. We do our best to bring you some fantastic betting offers and free bets with all our predictions, while you can explore further on our Promo & Bonus page. "BTTS Tips: Our Both Teams To Score Predictions"